Gilbert Sheard Oldroyd was born in Ossett on the 8th February 1892 and baptised at Dewsbury Road Primitive Methodist Church on the 22nd May 1892. He was the son of Chickenley couple Gerald Oldroyd and his wife, Annie (nee Mercer), who were living at Streetside, Ossett at the time of Gilbert’s birth. They had married in Spring 1889 in the Dewsbury Registration District and had three children from their marriage, but one child had died before April 1911. In 1901 and 1911, Gerald Oldroyd, wife Annie and their two surviving children, Ossett-born Gilbert, aged 19 years and Nora, aged 16 years, were living at Dewsbury Road, Ossett. Gerald was working as a spinner in a woollen mill and by 1911, Gilbert was a clerk in the County Council Offices at Wakefield. Sometime later, the family moved to live at 'Northlands', Bridle Way, Gawthorpe, Ossett. Gilbert Sheard Oldroyd’s army service record has not survived, but it is known that he enlisted in November 1915 at Ossett, and joined the King’s Royal Rifle Corps with service number C/12331. He embarked for France in April 1916 and was later promoted to the rank of corporal. Corporal Oldroyd was wounded in October 1916 and he died of those wounds on the 12th October 1916. Gilbert Sheard Oldroyd was posthumously awarded the British and Victory medals. The 21st (Service) Battalion (Yeoman Rifles) of the King's Royal Rifle Corps was formed in September 1915 from volunteers from the farming communities of Yorkshire, Northumberland and Durham by the Northern Command. They moved to Duncombe Park at Helmsley in January 1916, then in October 1915 they moved to Aldershot and came under orders of 124th Brigade in the 41st Division. On the 4th May 1916, the battalion landed in France, concentrating near Steenwerck, where they began familiarisation with trench warfare in the areas of Ploegsteert and the Douve valley, south of Ypres. They remained here until August 1916 when they moved to the Somme. After taking part in the Battle of Flers-Courcelette in September 1916 and the Battle of Le Transloy in October 1916. They moved back to positions south of Ypres in early 1917. In November 1917, they moved with the 41st Division to Italy but returned to France in March 1918. "The Yeoman Rifles had been allowed to rest until the second of October and the beginning of the battle of the Transloy Ridges, 7th to 20th October 1916, when the Battalion had not been reinforced, and with only twelve officers and three hundred and fifty other ranks had taken over a portion of Flers Trench, with a view to supporting an attack planned to begin on the fourth of October by the 26th and 32nd Battalions of the Royal Fusiliers, also of 124th Brigade, on a position known as ‘Bayonet Trench’ and the village of Ligny Thilley. The attack was eventually postponed due to wet weather until Saturday the seventh of October. Throughout this period the Yeomen had had been subjected to heavy shell fire, which had caused them severe casualties. The attack had eventually been launched at 2pm in the afternoon of the seventh, the two Fusiliers Battalions advancing towards Bayonet Trench, and the Yeomen following to carry out their task in the operation, that of building and holding two strong points in 'No Mans Land'. "Gawthorpe Corporal Fatally Wounded - Cheerful Letter Followed By Dread News - News of the death of Corporal Gilbert Sheard Oldroyd (24), of the King's Royal Rifles, son of Mr. Gerald Oldroyd, of Bridle-lane, Gawthorpe, has been received, following quickly a cheery letter from him, describing his wounds and speaking hopefully of his recovery. Like his father, Corporal Oldroyd was well-known and respected, the former having for years been a trustee, Sunday school teacher, and local preacher in connection with the Dewsbury-road Primitive Methodist Church, where the son, and Ossett Grammar School 'old boy', was a Sunday school teacher, besides being a local preacher, at the time he voluntarily joined the army in November last year. His occupation was that of a clerk in the education department at the County Hall, Wakefield. It was just after Easter, in April last, that he went into the fighting area. How he met misfortune is best described in his own words, conveyed in a letter to his parents. It is as follows: 'Dear Father and Mother, I am wounded in the stomach, and am going on nicely, quite as well as can be expected, and I hope to be all right in a few days' time. It is rather an inconvenient wound, as I am not allowed to eat anything, and I can only drink tea and a very little water; consequently, I do not altogether feel as strong as a bull. Now I hope you won't worry, as the doctor told me that I shall pull through OK, and the only thing is rest in a case like this. Otherwise, if I had been fit to stand the jolting of the train journey, I should have been much nearer home than what I am. I am staying in a big canvas hospital, some twenty miles behind the line, and everybody is very kind - the doctors, nurses and orderlies. It feels a treat to be in a bed - a real one, once more, after a few weeks of sludge. It is, to say the least, quite an agreeable change. Well, I suppose you will want to know how I caught it. I cannot tell it all in this letter and I must wait until I get stronger. We went into some trenches two or three miles behind our front line last Tuesday. The ground was awful, sludge six inches deep, and we spent two nights there. Then we went into the support trenches, a mile or so behind the front one. We stayed a night there, and received very heavy shelling from the Germans, losing five or six really good men. Then we went up to the front line as supports to two battalions who were to attack next day (Friday). We were working until 2 a.m. and up again at 5, but had a very quiet time, with the exception of our own artillery, which was pounding the German trenches to bits. When our barrage began, about 1.45 p.m., the Germans brought up machine guns on the right flank and they soon played havoc. I hadn't gone above 100 yards when I got one 'in the wind', and down I went. I managed to crawl to a shell hole, about 150 yards away, and lay there until 2 o'clock on Sunday afternoon. I cannot describe to you my experiences. I shall have to wait until I see you. I hope to get to a good place near home, and then you will be able to come and see me. So buck up, keep smiling, and don't get down-hearted. I have had a near squeak, but have much to be thankful for. I have seen the wounds, and they are quite clean and progressing. Corporal Oldroyd also forwarded a letter to his young lady, Miss Evelyn Pinder, a well-known local vocalist, in which he enclosed, as a souvenir, the bullet which struck him and caused his death." 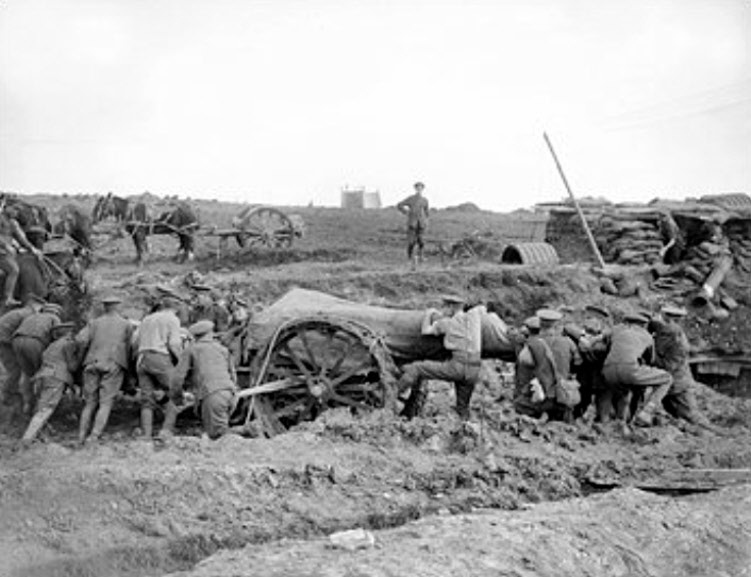 Above: British soldiers moving artillery at Transloy Ridges in October 1916. 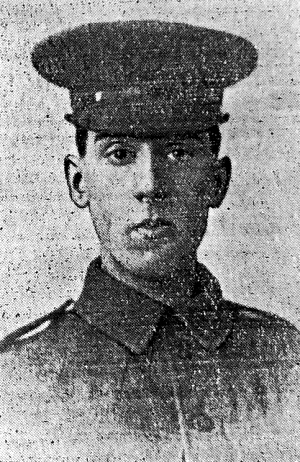 Corporal Gilbert Sheard Oldroyd, aged 24 years, died on the 12th October 1916. He is buried at grave reference IV. B. 79. at Heilly Station Cemetery, 3 Mericourt-L'Abbe, Somme, France. Mericourt-l'Abbe is a village approximately 19 kilometres north-east of Amiens and 10 kilometres south-west of Albert. Heilly Station Cemetery is about 2 kilometres south-west of Mericourt-l'Abbe, on the south side of the road to Corbie. There are now 2,890 Commonwealth servicemen of the First World War buried or commemorated in this cemetery. Only 12 of the burials are unidentified and special memorials are erected to 21 casualties whose graves in the cemetery could not be exactly located. The cemetery also contains 83 German graves.